Food Waste and Recovery was the focus of the 4th Annual Maine Hunger Dialogue at the University of Maine, Presque Isle Campus, on October 20-21, 2017. Bringing the Maine Hunger Dialogue to the crown of Maine and the heart of potato country was an impactful experience for students and staff coming from Central, Eastern and Southern Maine, many of whom may have never been exposed to the life and culture of this beautiful northern part of the state. Along with a focus on food waste and recovery, we partnered with the Campus Kitchens Project, whose 60 chapters across the US have recovered over 6.5 million pounds of food and prepared and delivered over 3 million meals to needy students and community citizens. 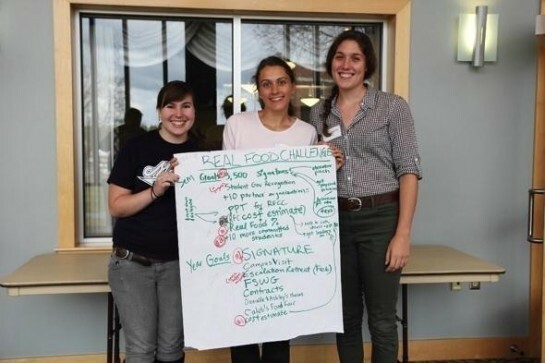 Through the Maine Hunger Dialogue we offered three $1000 Student Fellowships to inspire students to initiate food waste and recovery efforts on their home campuses. In addition, we offered eight $500 Mini-Grants to participating Maine Hunger Dialogue college and university students, for the students and staff to help launch hunger alleviation and education programs and projects at their home campuses. Student Fellowships and Mini-Grants applications were available to participating students. Applications were due in mid-December to give the students and staff time to finalize their plans following the Maine Hunger Dialogue. Speakers included Joel Berg, Author and Hunger Activist; Alex Moore, Author and Hunger Warrior with DC Central Kitchen and Campus Kitchens Project; Scarion Rupia, Sustainable Agriculture Professional from Tanzania, and Dixie Shaw, Hunger Activist with Catholic Charities of Maine. Dialogue participants were connected with resources to benefit Mainers who are among the 48 million Americans, estimated by Feeding America, to be living in food insecure households. In addition, to discussing food insecurity issues, participants honed skills to design, communicate, and launch effective community-supported hunger-alleviation projects. Planning team members provided coaching and technical assistance. At the prior three Maine Hunger Dialogues at UMaine, 340 faculty and students from 20 college campuses and one high school committed to action plans to address hunger in their respective communities. Twenty-nine campus teams were awarded $500 grants for hunger-alleviation projects that were used to establish or maintain campus food pantries as well as plant campus-based community gardens to produce fresh vegetables for local food pantries and for students with low incomes. 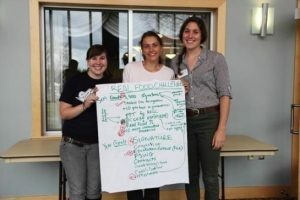 Other projects created campus food recovery networks to redirect cafeteria surplus to local food security organizations, as well as promoted campus hunger awareness, student engagement activities, and organized fundraisers that resulted in $2,500 for the Mid-Coast Hunger Prevention Program. Lisa Morin, coordinator with the Bodwell Center for Service and Volunteerism at UMaine, says she’s excited about the support received, which has allowed the event to continue for a fourth year. “These students want to make a difference and the Maine Hunger Dialogue is helping them to achieve sustainable change,” she says. University of Maine Cooperative Extension in partnership with Maine Campus Compact and citizen volunteers hosted the 2014 Maine Hunger Dialogue on the UMaine campus in Orono, October 16-17, 2014. The 2015 Hunger Dialogue took place November 6-7 at the UMaine campus in Orono. The 2016 event was held October 28-29, 2016 at the University of Maine at Augusta in Augusta.